We kicked things off with a look at the talk time of the imposing smartphone. 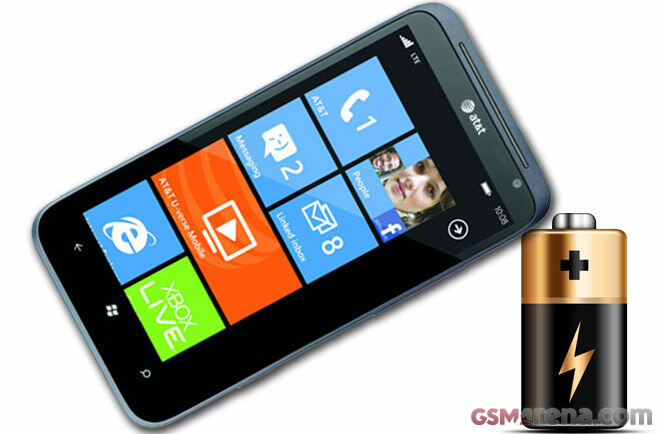 The HTC Titan II managed only 5 hours and 10 minutes on a single charge – hardly a record-breaking score. Things got only marginally better in the web browsing section of our battery trial. Here, the Windows Phone device made it through 4 hours and 5 minutes of continuously running our script. As you have probably guessed, the 4.7″ S-LCD screen is the one to blame here – there’s a reason these things don;t have a reputation of being power-sippers. You must also keep in mind that the web browsing battery trial is performed over a Wi-Fi connection. Should you go for AT&T’s speedy LTE network, you can reasonably expect an even shorter time. The HTC Titan II recorded a rather decent 5 hours and 50 minutes of video playback. We attribute the acceptable score to the fact that the smartphone’s radio was not in play here, as usual, we ran it in Airplane mode. 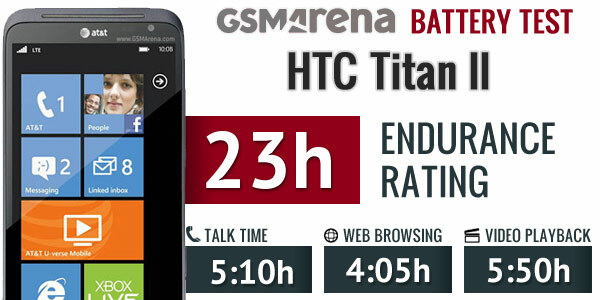 The overall endurance rating of the HTC Titan II panned out to be a rather disappointing 23h. This means that you will need to recharge your device every 23 hours, if you use it for an hour each of telephony, web browsing, and video playback per day. As you can notice, the HTC Titan II managed to dip below 24 hours of battery endurance. While seriously unimpressive, the result is hardly a surprise, given the relatively small battery, which the device has on tap. You can find out all about the HTC Titan II in our detailed review.